Tips for living with macular degeneration are best given by someone who lives with the vision changes associated with this retinal eye disease. 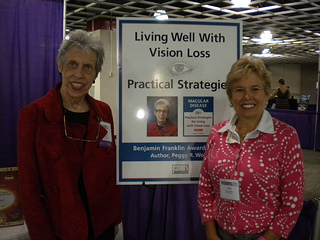 Peggy Wolfe the author of Vision Loss: Strategies for Living with Hope and Independence was diagnosed with macular degeneration at the age of 69. She writes in her book, "My goal is to give useful hints to my fellow travelers on the path to living with peripheral vision." You will find lots of useful and practical hints and strategies for everyday living - tips you can use in the kitchen, in your closet and in the bathroom. She shares some of them with us here. 1. Tell us about your macular degeneration. What kind do you have, how long have you had it and how is your vision affected? I now have both kinds--dry macular degeneration in my left eye and wet in my right. In 1999, at the age of 69 and with 20/20 corrected vision in both eyes, my ophthalmologist saw the first signs of macular degeneration during a routine eye exam. She sent me to a retinologist, and he confirmed the diagnosis. He asked if I’d be interested in participating in a five-year study that was just beginning. It would mean having low-level laser surgery in one of my eyes, as the purpose of the study was to test the effectiveness of this surgery to slow the progression of the disease. I immediately joined the study; It turned out that this and similar studies showed no advantage to the laser treatment. Over the succeeding years my vision gradually declined, with greater loss in my left eye, but I was still able to drive in the daytime and able to read quite easily with good lighting. Then in 2007 on my 77th birthday I started to notice a change in my right eye. I couldn’t read the ends of lines and the type was blurry. While I tried to ignore these changes, my son convinced me to call the retinologist for an immediate appointment. He saw bleeding in my right eye, but he told me there was a new treatment--an injection of a drug into the eye. I had a shot of Avastin and my sight immediately started to improve. I had only one more treatment for that first episode of bleeding. In the spring of 2010 I had a recurrence of bleeding, and so far I’ve had four monthly shots and at each visit there has been an improvement. Still, over the 11 years since my diagnosis, my vision has declined to the point where I’m no longer able to drive, but thankfully I’m able to read large print when I have a lot of lighting. 2. In your book, Vision Loss: Strategies for Living with Hope and Independence , you talk a lot about attitude. What attitudes have helped you cope with your vision loss? Acceptance: Realizing that life is change and mine will include limitations that I didn’t expect and can’t change. Mood boosting: Exercising, calling a friend, playing a game, taking a nap. 3. Being able to read is a major concern for those with macular degeneration. What visual aids do you use to help you with your reading? The most important is adequate lighting to provide contrast between the type and the paper’s background. Over the years I’ve kept adding more and more lamps and experimented with various types of bulbs. For printed material I use a book stand that holds up the pages to eye level and tilts backwards for easier reading. I use my computer constantly and, for my documents and e-mail messages, I’ve set the font to Frutiger. It was chosen for my book after several fonts were tested with support groups and it was judged the easiest to read. When the print on an internet site is too small, I enlarge the type size on my screen. I keep in mind that there are still many more visual aids I can use as my vision decreases, such as magnifying glasses, video magnifiers and binoculars that attach to eyeglasses. 4. Your book features many practical tips for living with macular degeneration - like brushing your teeth. Share with our readers what you wrote in your book on how to make this daily task easier. Use an electric toothbrush that is kept upright in a stand or on your bathroom vanity in between charges. You’ll be able to find the toothbrush easily, and electric toothbrushes help you to take good care of your teeth. Buy toothpaste in a pump dispenser that stands upright on the counter. This is easier to find than a tube with its tiny cap that can easily disappear when you put it down on your bathroom vanity. Solve the problem of getting the toothpaste onto toothbrush bristles that may be difficult to see by putting the toothpaste on your finger, then transferring it to the toothbrush --or, even easier, by put the toothpaste on your finger, then transfer it directly to your mouth. Another bathroom hint is to put a box on the vanity counter to hold frequently-used small items such as dental floss, lip balm, emery boards (safer than cutting nails! ), night cream, and comb. This will save frustrating efforts to see inside the medicine cabinet. 5. Learning some easy strategies in the kitchen make it possible to continue cooking. Tell us what you do to identify the different sizes of your measuring cups and spoons. I use a paint pen to make permanent, dishwasher-proof raised dots on the handles. So I can tell one measuring cup from another, I put one dot on the 1-cup measure, two dots on the 1/2-cup measure, three dots on the 1/3-cup measure, and four dots on the 1/4-cup measure. I used the same system on my measuring spoons. To find the right measuring cup or spoon, I pick one up and slide my thumb along the top of the handle to feel the number of dots. The pens are available at catalog/Internet low vision stores. They come in a variety of colors, including black, white, and orange, and the paint adheres to just about any surface, including plastic and metal. 6. The sense of touch becomes more important as vision diminishes. Give us some examples of how and when you use touch to help you with daily living tasks. Besides the example I just gave of using my thumb to feel the number of dots on measuring cups and spoons, I use my index finger rather than a knife to level off the dry ingredient I’m scooping. The same goes for my coffee scoop--I never even try to see the amount of coffee because my handy finger tells me. I identify plates and silverware by feeling the size and shape, especially useful when putting away clean dishes. I can tell the level of cold liquid in a glass or cup by placing the thumb of my non-pouring hand inside the glass or cup and stop pouring when I feel the liquid touch my thumb. 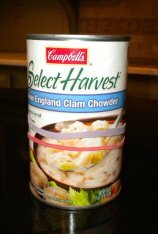 You can use rubber bands to identify the contents of soup cans, for example, no band for your favorite tomato soup, one band for chicken noodle, and two bands for split pea. I use my sense of touch when I change the battery in one of my hearing aids. I try doing it with my eyes closed and practice has made perfect. In a hint similar to using a paint pen, I buy tactile bumps of different shapes, colors, and material to mark a variety of objects. These bumps are among the most useful things in my everyday life. 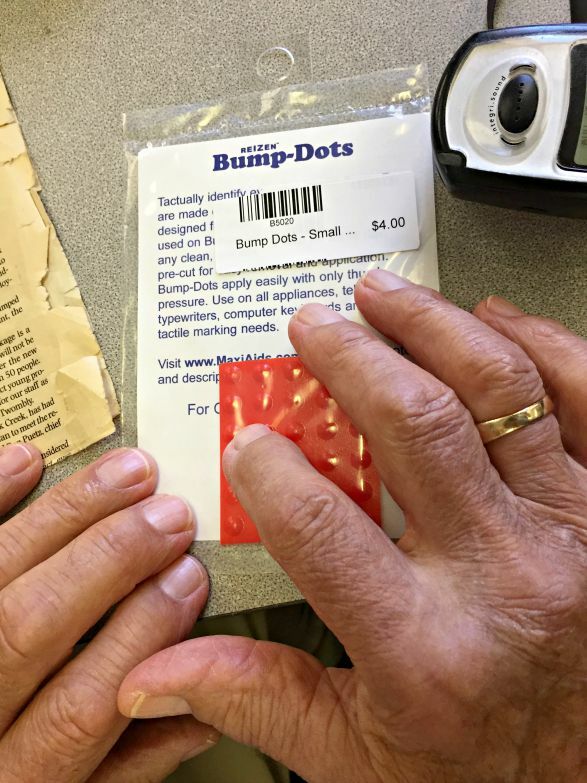 Available at low vision stores, these bumps adhere to most surfaces, and they make it possible to find all sorts of things by touch. As the years have gone by, I’ve added the bumps to more and more items. In my kitchen, I use them on the dishwasher’s power button and on the microwave oven’s “one minute” and power level buttons. On the TV remote control I have bumps on the power, volume, and “channel up” buttons. My computer keyboard has several bumps, each with a different color or fabric that I can feel. For instance, the “Enter” key has a large flat brown felt circle, while the “Shift” key has a small raised orange plastic bump. Having these bumps on my computer keys is helping me develop my touch-typing skills for the day I may not be able to see any letters identifying the keys. You, too, will be able to find many uses for these inexpensive items that make life so much easier. 7. Finding the clothes you want to wear in the closet can be a challenge. Share your tips for organizing clothes so that they can be easily identified. Seeing the difference between black and brown clothes in my closet has become impossible, so I use the safety pin trick on pants and tops. I have more black than brown, so I don’t code black items. For brown, I put a small brass safety pen in the back label, waistband, etc. For another color, I would use two pins. I just feel for the one pin when brown is the color I want. 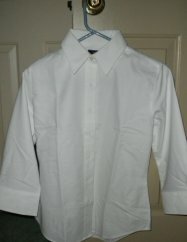 Use white garments to separate the various colors of tops and shirts in your wardrobe. The colors of my clothes are organized in my closet in this way: white, pink, white, black, white, blue, white, brown. When certain items go only with each other, hang them side by side. Leave the white paper on hangers from the dry cleaners to provide color contrast--that makes it easier to see what is on the hanger. Get colored plastic hangers and hang blue tops on blue hangers, brown on brown, and so forth. This is an easy color-coding system. Many more ideas in the book will help you become a creative problem solver in living your life with macular degeneration. √ Macular Degeneration Clinical Trials?